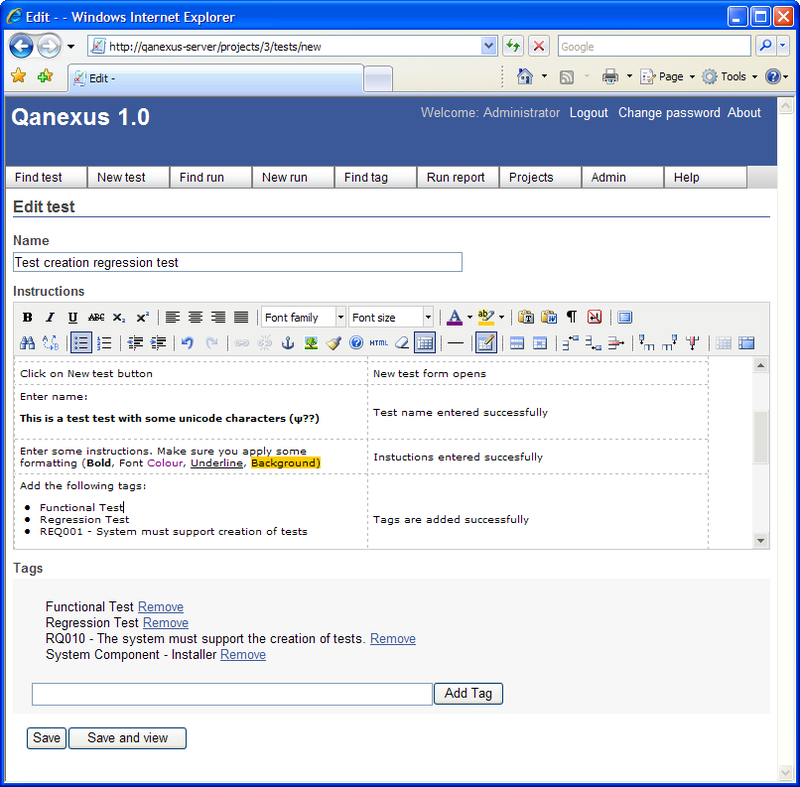 Qanexus automates the administration of test cases, test scripts and test results. Unlike Microsoft Word or Excel documents Qanexus maintains all the links between the different items of test documentation and ensures that relevant information is never more than a few clicks away. It's innovative, tag based organization means that reporting and planning are completely painless. Qanexus makes test management as easy as possible. ...... the links stored within the system, Qanexus can always give you an up to date and accurate picture of what has been done and what remains of your testing. No need to waste time trawling through documents and folders to get a progress report. * Never loose anything - Because there is a single server where all the information is kept. Everybody knows where it is and it can be backed-up and administered easily. Qanexus is specially designed to make Administration as easy as possible. * Save time and money - Qanexus is web based and contains everything you need for editing test documentation, no other software needs to be installed to be use and manage test documentation. Qanexus is instantly available on every computer on your network, once the server is installed. Qweas is providing links to Qanexus 1.0.0 as a courtesy, and makes no representations regarding Qanexus or any other applications or any information related thereto. Any questions, complaints or claims regarding this application Qanexus 1.0.0 must be directed to the appropriate software vendor. You may click the publisher link of Qanexus on the top of this page to get more details about the vendor.